Biological research improves our health and quality of life, but many Americans do not know how this research is supported. 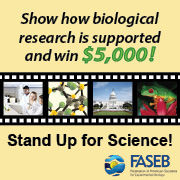 For a chance to win $5,000, submit your 1-4 minute video describing how federal agencies fund science. Due Nov 30th. What does your "A" game look like? Make your favorite GOgroove product a star! Due 12/02/13 | Prize: Apple iPad 2, the GOgroove product of your choice + more! Elaborate on the current Protein Fight Club campaign. What's your mortgage horror story? Grab your axe. Learn the chords to 'Listen to the Music'. NJ preteens + teens, are you up-to-date on your vaccinations? Listen up, students in KY! Can you throw down on the dance floor? Planning to study / volunteer abroad? Are you a lady in high school who's interested in a STEM career? Due 10/20/13 | Trip: Trip to Los Angeles for the Thor premiere + more! Are you ready to dance with the undead? Get dressed up as your favorite character and make a video. SoCal students, use physics to explain a strange/unusual phenomenon. Let Americans know how biological research is supported! What about yourself would make for a great Winemaker's Apprentice? What magical things could be happening inside a Toshiba 4K TV? Upload your best action sports video to kick it with the Thule Crew. Experienced videographers: Push Magisto to the limit! Make a video that focuses on how humans move. Nominate a Breast Cancer Hero for a Dream Room Makeover. Capture the beneficial relationship between humans and robots. How do you cheer on your favorite college sports team? Due 01/31/14 | Prize: 55" LED HDTV + more! Want to start a business? Consider a Liberty Tax franchise! Make people aware of Instaprints and make 'em laugh. Make a :15 ad for Streaming Media Producer. Another chance to show off your reel! Does your child have big dreams for their future? Got a great demo reel OR documentary film reel? Tap into the feeling you had the last time you truly shined. Are you the ultimate Hobbit fan? Make a :15 pre-roll ad for the new Mountain Dew Game Fuel Slurpee. Make the music video for this jaunty reggae track from Patrice. How does your school support students with intellectual disabilities? Developers, it pays to be a geek! Due 10/09/13 | Prize: A Canon EOS Rebel T5i + more! Due 10/20/13 | Prize: Fame, glory, bragging rights!